ACERT C-15 in a Kenworth T904. Called the ‘King of the Hill’ in the United States, the top power ACERT C-15 is Caterpillar’s replacement for the C-16, which has already ceased production for the US truck market. At 625 horsepower it is one of the most powerful engines available anywhere for highway use. 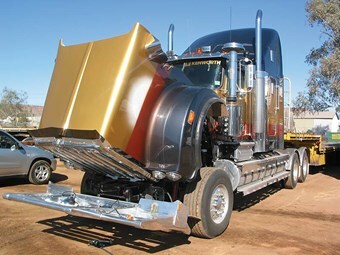 Although not necessary here in Australia until the introduction of ADR 80/01 in January 2008, engine makers like Caterpillar are getting product onto the roads of Australia early to ease buyers concerns about the new technologies that will be needed to meet new emission rules. On a drive from Melbourne to Alice Springs Owner//Driver put the new Cat engine through its paces. Fitted in a Kenworth T904, the engine’s massive torque output of 2,780Nm (2050 ft lb) makes easy work of pulling the loaded trailers en route to the Transport Hall of Fame’s 10th anniversary event. The T904 is fitted with an 18-speed RoadRanger box and runs on six-rod suspension. It is rated to a GCM of 90 tonnes and is set to undergo a more severe test pulling three-tipper road trains in the Tanami in the coming weeks. Running at just 18 tonnes from Melbourne is not really testing the truck at all but it does demonstrate the smooth quiet power of the big C-15. Running along at 1600 rpm at 100 kilometres per hour the engine noise is just audible. When climbing hills it’s necessary to turn off cruise control as the truck doesn’t slow at all for the grade and can come into corners a bit too fast. This is effortless power and there was very little gear changing over the entire route. In fact, coming into Adelaide from Melbourne the truck never had to change down from top gear as the convoy came into town through the hills. Caterpillar’s OEM Manager Ian Loy is travelling with the truck and will be running tests on the engine’s performance as it handles the hard grind hauling the triples. "What we are trying to do is check that the cooling system is working well," explains Loy. 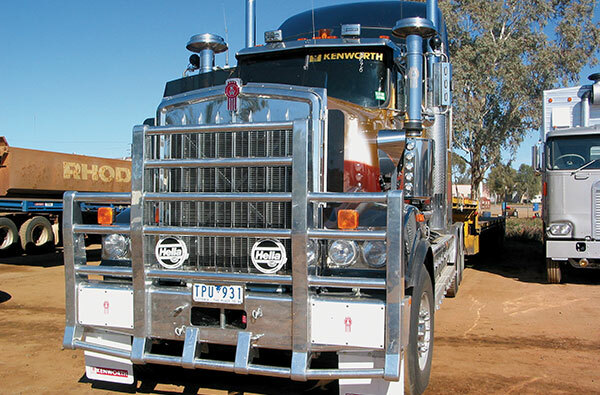 The installation includes a cooling package fitted by Kenworth that Loy describes as: "Awesome, I just know it cools well and will provide the engine with plenty of cool water." Cooling is going to be a major concern on all of the next generation North American engines as all of them use technology that considerably increases heat rejection. The exercise of running these engines early in the piece is to demonstrate that there is no need for concern about cooling. Doubts in truck buyer’s minds could decrease the chance of a large pre-buy in the lead up to 2007/8. Loy says the conditions the engine will have to endure during testing will be tough. "This will be the engine’s first experience with a triple road train, it will also be running on low tyre pressures," hr says. "we’ll see how it goes." The trucks that normally handle this application usually run on 4.5 diffs but the T904 is using 4.3 diffs, meaning the engine will be working even harder than normal. ACERT: What is it and how it works? It is a pair of series turbos that lie at the heart of the improvements in combustion that Caterpillar has developed in their ACERT engines. 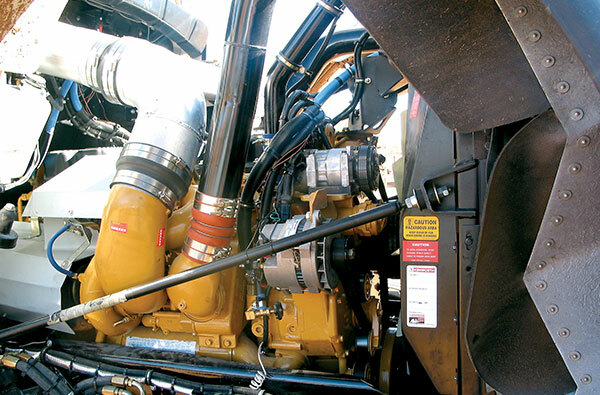 The new air management system has allowed Cat to get emission levels over the line to meet current United States emission rules and ADR 80/01 in Australia in 2008, without resorting to Exhaust Gas Recirculation (EGR) or Selective Catalytic Reduction (SCR). The ACERT technology uses series turbochargers to force extra cool, clean air into the combustion chamber. This turbocharger arrangement is claimed to improve engine response while lowering nitrogen oxides (NOx) and increasing fuel economy. Caterpillar say that the technology is also able to control the air volume required at various engine loads and speeds, resulting in more complete combustion. This is accomplished through precise control of valve actuation in relation to camshaft actuation. Valve position is changed based on engine demands, as monitored by the Cat electronics. The MEUI (Mechanical Electronic Unit Injector) delivers a split injection fuel delivery to the combustion chamber. After a small pilot injection, a millisecond later, a larger volume of fuel is used as the main injection. In addition, MEUI is said to have the ability to ‘shape’ the rate of fuel delivery into the cylinder controlled by the engine’s ECM. The split fuel injection strategy lowers peak cylinder temperatures, allowing fuel to burn more completely and also reducing the level of NOx created in the combustion process. In order to avoid going down the EGR or SCR route the ACERT technology has to tread an extremely fine line of performance, integrating all of the elements via the ECM to keep the combustion process within strict parameters. Not enough air from the turbo chargers at the right time and the result will be incomplete combustion. This creates increased particulate matter (PM) in the exhaust. A different ‘shape’ to the injection of fuel could mean higher temperatures in the combustion chamber and boost NOx in the exhaust. The right combination required to create these clean exhaust events changes as engine speed and load alter. As the engine automatically adapts to airflow needs by increasing or decreasing turbocharger boost, the ECM sends out signals that variable valve actuators and fuel injectors convert into mechanical responses. The ECM keeps the balance of the three systems controlling combustion in check, treading that fine line between complete fuel burn and low combustion temperature. But this still doesn’t get the Cat emissions over the line. The final piece of the jigsaw is the aftertreatment of the Caterpillar Diesel Oxidation Catalyst (DOC). The stainless steel Cat DOC has no moving parts, requires no maintenance, and is designed to last as long as the engine itself. Located in the exhaust system, the DOC consists of a honeycomb structure covered by a chemical coating that acts as a catalyst. As hydrocarbons, carbon monoxide and particulate exhaust emissions pass through the DOC and come into contact with the catalyst, they are chemically converted into carbon dioxide and water vapour, harmless substances that are subsequently passed on out of the exhaust system.